If you want to keep deer on your hunting land, they are going to have to eat. When there is forage available, deer will usually find it but if your land is devoid of natural food sources or those sources have dried up prior to deer season, the best method is to supplement their diet. Having a good feeder is important, especially for bow hunters who really need an advantageous position to make a clean, ethical kill. For those hunting rifle or black powder, the issue is less important but still a viable solution to improving their odds for deer season. Deer feeding isn’t without its issues and critics but there are advantages to feeding beyond the idea of an ‘easy target.’ Whether or not you use a feeder, it is important to understand these issues and be responsible in where and how you feed. When you bring deer together you risk the spread of contagions and can cause harm to whole deer populations. Deer feeders can also change the behavior, diet, and movement patterns of a herd and can have long-term negative effects on other species. But there are positives to baiting during hunting season aside from helping hunters. Without deer seasons, the whole deer population could become unhealthy and damage to the local ecosystem could be far-reaching and lead to the eventual extinction of other plant and animal species. Overpopulation is a real threat. Feeders that allow hunters to take their quota are one method of regulating the number of deer in an area and keeping populations at a level that is healthy and sustainable. Baiting is a good way to assist hunters in culling the deer population in their area, keeping the population at a manageable and supportable level. Whether or not you use a feeder is a personal choice but you should be aware of local laws which may ban or severely restrict the practice of feeding. A full list of state laws on feeder and bait use can be found here. Our number one responsibility as hunters is the preservation of a healthy population. When using a feeder, make sure you are using a food that is suitable for a deer’s diet and always use a high-quality feeder that can allow you to have some level of control over how you are using your feed. To make things easier, we have explored the best deer feeder out there. It would be hard to talk about feeders without Moultrie showing up. They are the reigning world champs of rugged feeders of all types that are easy to setup and use while still having the control to make sure you are feeding the right amount at the right time. Moultrie makes a variety of tripod feeders and I can heartily recommend getting the Unlimited model. It is far superior at keeping out pesky varmints. The anti-clog mechanism makes it worth the extra cost. Otherwise, it has all of the features of their lesser models. 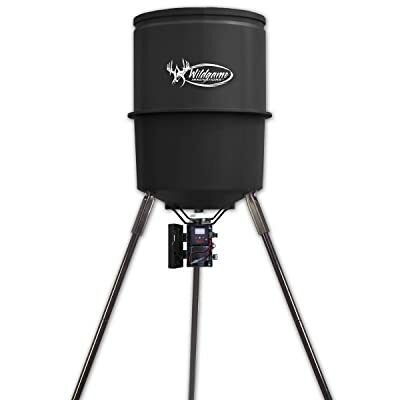 All of the Moultrie Tripod feeders have a durable, easy fill hopper that is large enough to hold more than a hundred pounds of most feed. Even their base model is easily programmable for proper feed quantities and times. All of the upgraded models have varmint guards and are compatible with 6v solar chargers. Everything you could want in a feeder, you can get it with Moultrie. Of course, sometimes you can’t get the space in the dense woods for a tripod style feeder. Not to mention they are large and hard to transport. For those situations, few feeders are better than Moultrie’s hanging feeder. The hanging feeder lacks some of the bells and whistles of the tripod model but keeps most of the important stuff. It has a large capacity and spreads your feed in a large area. It is compatible with solar chargers and can be programmed for feeding times and duration. 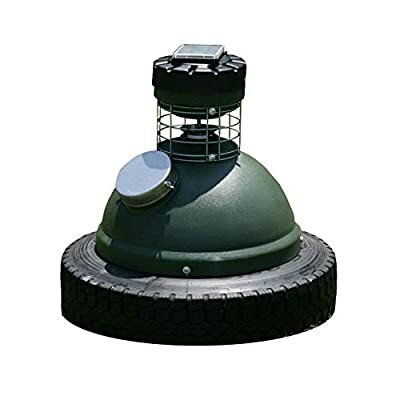 By far the best feature of this feeder is its collapsible feed reservoir that can be easily transported and set up in the field without the need for an ATV or some other form of conveyance. 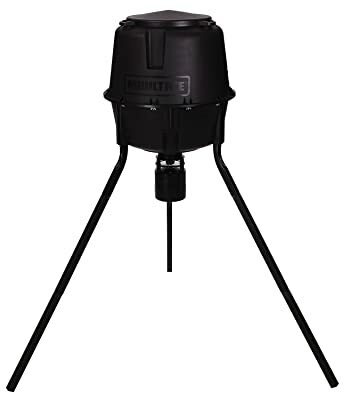 This is great for areas where minimal disturbance is necessary and costs a fraction of what the tripod feeder costs. You can also opt to use your own bucket and get the Sun Slinger if you want a pre-setup solar feeder. 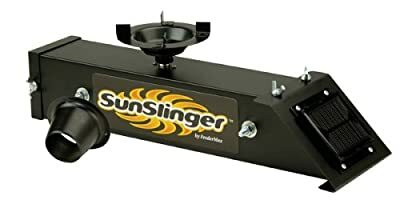 You can also attach the Sun Slinger to most other feeders if you have an old one that isn’t solar capable. While it may lack the durability of the Moultrie, this is still a highly functional and rugged unit that will give you years of service if properly used and cared for. It comes with a solar charger and programmable timer with up to 15 pre-set feed times. All in all, this is a very affordable unit that is easy to setup and use. It is versatile enough to use with a variety of other feeders as a replacement spreader. It is directional which can be a limitation it also means that attaching it to a tree won’t impede the feeder action. Adding a varmint guard would be a good idea! If you are looking for a budget option on a tripod stand but don’t want to give up too much quality you could take a look at the Quick-Set 225. 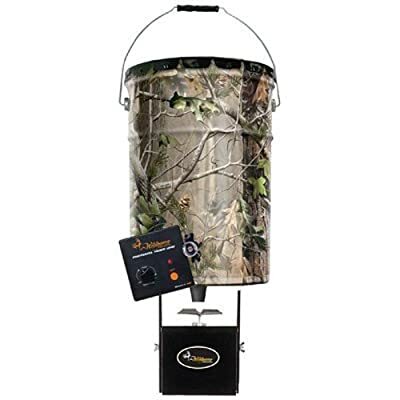 It may not be as good as the Moultrie feeders but it is significantly cheaper. It may lack a little of the stability of other tripod feeders but has all of the durability you could expect. Rather than being able to program your own times, you can select up to 4 available feed times daily. If you don’t want to fine tune your feeding, this is a much easier setup to deal with. The 30-gallon hopper is easily big enough to feed for weeks if you watch your daily use. No solar option out of the box on this one but a 6-volt battery should last you for a while. If the wallet is a little lighter than you would like, this is a good feeder for the money, kinda heavy though. Of course, if your wallet is really light this year or if you are just starting out with a deer feeder and want to do it on the cheap, there is nothing wrong with the WGI Pail feeder. It doesn’t have much in the way of extras but it does have everything you need. Like most feeders, it operates on a 6V battery and can run for a long time between battery changes. It has a 6-gallon hopper that will hold sufficient food for at least several days. It isn’t programmable at all but you can select to feed at the two most important times of the day, dawn and dusk. This is a no-frills feeder for those who just want to get the job done on the minimum. It is durable and will last for a few seasons but it won’t offer you the lifespan or options of one of the better feeders. For someone just trying feeding out for the first time, this is perfect! Being both a style and a brand name, these feeders are truly the best on the market. So why are they at the bottom of the list? One reason only; cost. Unless you have a lot of disposable income, these feeders will take a big bite out of your savings account but if you want the best, this is it! Everything you could want in a feeder, you can get with a Capsule Feeder. They are solar charging right out of the box, the hopper is huge for days of feeding, and they can be programmed for just about any time and duration you would like to feed. 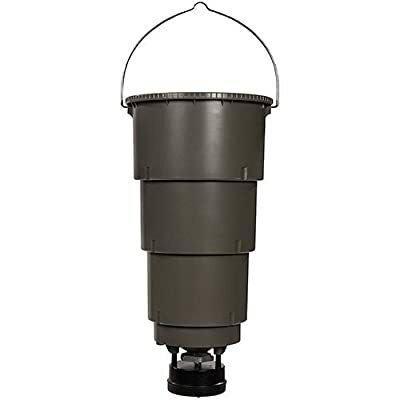 These feeders are also much safer to deal with than hanging or tripod feeders where you have a couple hundred pounds of feed above your head. If you can afford to shell out for one of these puppies, they are worth their weight in gold! The major considerations that will decide what deer feeder is best for you will be the size of the area you are baiting and the quantity of deer in that area. Other considerations like portability, capacity, battery life, and solar options will be important but secondary factors. For larger tracts of land, choose a feeder that has a large capacity and battery life if you are able to move it into location and maintain it. The last thing you want to have to do is head out daily to refill your feeder and disrupt the deer feeding there. Feeders like the Capsule and tripod feeders are your best bet. The above advice will hold true if you have a large deer population you are trying to feed. Not having enough food in the feeder to keep them interested could lead to poor success with that feeder. Options like solar are more important, the more times a day your feeder is active. If you have a large herd, solar is a lifesaver. If you have no conveyance to get the feeder to your feeding site or it’s just too rugged to get an ATV, you will have a very hard time with the larger tripod feeders. 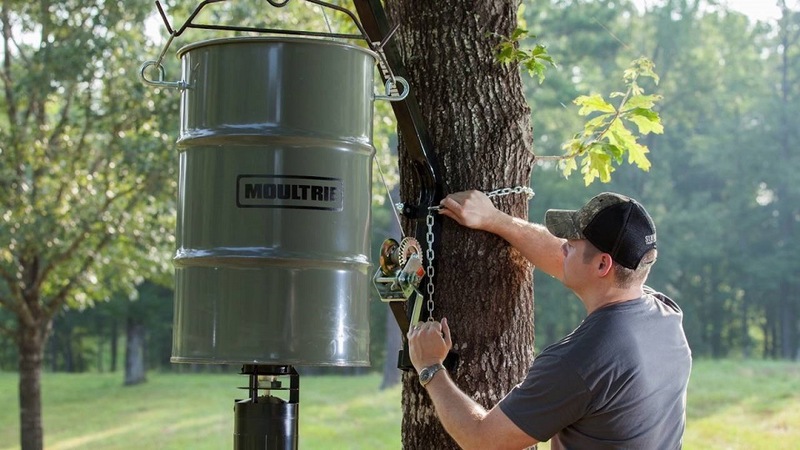 The Moultrie All-In-One is a perfect solution though you will still have to deal with dragging large bags of food out to the site at regular intervals. For situations like this, a bucket or hanging feeder is your best friend! It is recommended to have the largest capacity feeder you can set up and maintain. The less you have to interact with the feeder to refill it, the more success you will have. Keeping your feedings to a minimum amount for what you need and having a large stock in the feeder are always a better bet. Battery life and solar power work about the same as capacity. You don’t want to disrupt things to change a battery. Solar is a life saver if you can get it. Most feeders have affordable options for solar charging and are a worthwhile investment. The optimal setup would be a large capacity tripod feeder set to a low food output with solar power to keep it running. Optimally you would visit the site less than once a week until hunting season. There is an alternate theory that visiting a site often can acclimate deer to your presence but I have never seen it successfully implemented. Sure, there are other quality feeders out there, some of the best can cost into the thousands of dollars. For what we need to do as hunters, the above options are the best to do what we need without breaking the bank. Whatever style of feeder you go with, do your research and use it ethically and responsibly. Make sure baiting is legal in your area or you may lose the right to hunt altogether. If your local deer population has a strain on it from disease or a hard winter, consider that before placing your feeder. We are closing in on deer season, it’s time to get stuff together and get ready. No more procrastinating, opening day will be here before you know it! Q: What kind of feed should I use? A: Many people use straight corn in their feeder which is fine as long as the deer don’t count on it for a major portion of their diet. If you are feeding deer frequently or with larger quantities, use a blended feed formulated for deer. If you use pellet feed, make sure it is swell resistant to prevent clogging of your feeder. Q: How many times a day should I feed? A: Realistically, feeding two times a day will be sufficient. You don’t want the deer to get in the habit of coming to your feeder after dark when you can’t hunt. Stick to feeding at dawn and late evening. Q: How much food should I feed at a time? A: You will have to match your feed quantities to your deer population but never feed more than you have to. Keep feeding just enough to give them a reason to stop but not enough to become a major part of their diet. You don’t want them to get dependent on the feeder only for you to stop using it after deer season when food is already scarce. Q: What are ethical feeding practices? A: Feed food that is formulated for deer and will provide complete nutrition. Corn will attract deer but in large quantities, it can be fatal. Feed in small enough amounts to attract deer but not too large. Your feeder should be a place that deer stop but not linger. Deer that congregate for long periods at a feeder risk spreading diseases. Q: How much land can a feeder cover? How many feeders do I need? A: This depends on the size of the herd on your property as much as it does the size of your property. If you are using small feeders, one every 100 acres is sufficient. 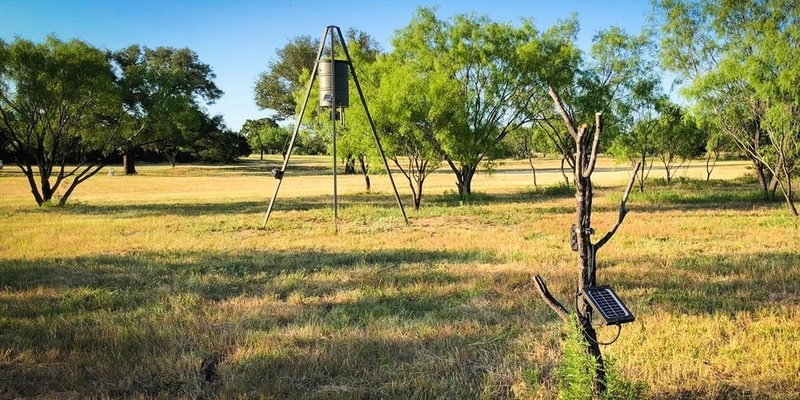 No matter the size of your property, don’t place more feeders than you have places to set your stand. No need to waste money or feed. Q: Should I add a mineral block in the same area as my feeder? A: Mineral blocks are a point of contention when considering the spread of diseases. They are a great way to attract deer but if you notice sick deer in your area, avoid mineral blocks and probably feeders as well. Q: Does the feed in the feeder go bad if it sits too long? A: Most feeders will keep feed dry and safe. Corn or other natural feeds should be fine for months in a feeder. Check your feed for mold when you refill but if its clean, leave it. If you use pellet feed, follow the manufacturer’s recommendations. If you have moldy food, dispose of it and thoroughly clean your feeder. All of these feeders are ” big store shelf items ” nothing more. Go to fieldpro.com and see what a quality feeder is. I have no affiliation with the company other than have 8 of these running and they are the best I have tried. My oldest is 10 years old and still slinging corn. Of course they cost a little more but you do get what you pay for.